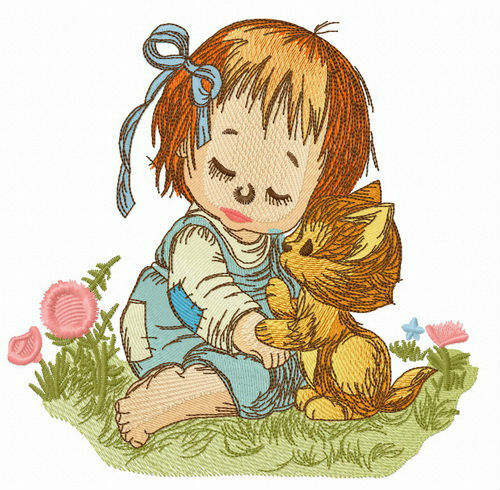 Check out this adorable embroidery design featuring a girl fast asleep on a meadow. A cute tabby kitten is trying to wake her up. 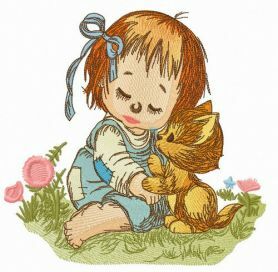 The girl is dressed in a blue outfit and has a matching blue ribbon in her short red hair. Green grass of the meadow and soft pink flowers create a perfect summer background. A combination of pro cinnamon, orange, sprite, honeydew, cottage beige, mushroom and bitteroot makes a gorgeous warm palette. You can use this application for a variety of creative objects, for example towels, pajamas, nighties, cushions, blankets, quilts, onesies, T-shirts, sweaters and more. could you edit this model for Brother machine , Innovis M 240ED? Thanks! its urgent! Embroidered the pretty girl pattern on a towel for my neighbor's daughter. It would be a nice gift, I think. Stitched out neat and fast on my embroidery machine, thanks to the seller! Lovely design! Stitched out the baby with pet ideally on my Brother PE 800. Gonna use it again in different cases. THanks! Beautiful Item, Too cute! Plan to use this and other designs in a blanket. Perfect Transaction! Fast response and file stitched out beautifully, thank you! Stitched out nice. Thank you for good digitizing.